Charles-Claude Flahaut de la Billaderie, comte d'Angiviller (1730–1810) was the director of the Bâtiments du Roi, a forerunner of a minister of fine arts in charge of the royal building works, under Louis XVI of France, from 1775. Through Flahaut, virtually all official artistic patronage flowed. 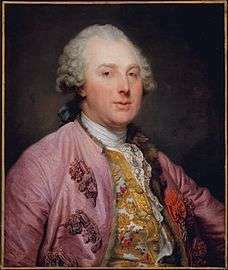 His portrait by Joseph-Siffred Duplessis, 1779, is conserved at the Musée du Louvre.